Bulk Handling Global is very pleased to be able to announce that the company has recently been appointed Australasian agents for B.S.P Engineering (Italy). B.S.P. Engineering is a leading European designer and manufacturer of spiralled silo systems. 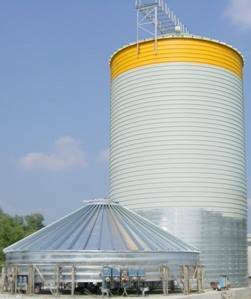 These silo systems are cost effective, as they use a rolled lipp form construction, and no welding is required. This system eliminates typical common welded silo problems such as weld fatigue, quality issues, rusting and delivery (damage, avoids special permit and delivery curfew) issues. The silos and storage tanks are constructed from coil material using special roll forming machinery, and are formed ground up, on site. The lipp formation of the silo provides far greater strength than standard plate or corrugated iron construction. The storage systems can store minerals, grains, powders and liquids. The diameters of silos and bulk liquids tanks range from 2.7m diameter up to 25m diameter. Height of dry bulk storage silos can be up to 35m. Capacities ranging in the order of 3790m3 dry bulk storage, and 4 megalitres liquids storage. The materials used in construction can range from mild steel, galvanised steel and stainless steel, to combat aggressive environments. Also available, are special alloys and dual plate materials such as Inox and Platinox. The spiralled silos can have either flat bottomed or conical hoppers. The high strength construction accommodates any process requirements such as fumigation, air and water tight, blending, heating and cooling. We have proven silo design techniques to meet process requirements. Projects include grain storage, cement silo storage, minerals, and food products. The alliance with B.S.P. (Bulk Storage Plants) Engineering has come about as strategic and natural progression of the company’s development, and to strengthen its position in the Australian silo market. No other Australian silo supply company has in house bulk solids and powder flow properties testing capability. The bulk solids flow testing can be carried out in laboratory, or on site.